Maybe you did not know but I did all my work on GIMP (photoshop alternative). However I just acquired a drawing tablet and it’s not supported. Sooner or later I had to take the plunge. 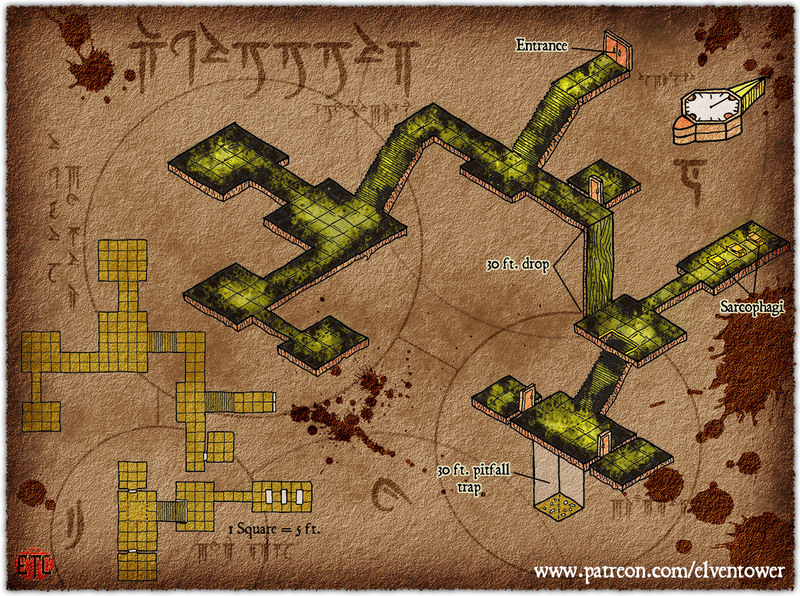 So this is the first map produced entirely in Photoshop, it took more than usual because I’m getting used to it. It’s a superior tool and will help me deliver better results. Also, for those of you who check out the PDF documents, I’m also doing that now in InDesign. You’ll see that the quality of my PDF attachments has improved significantly. 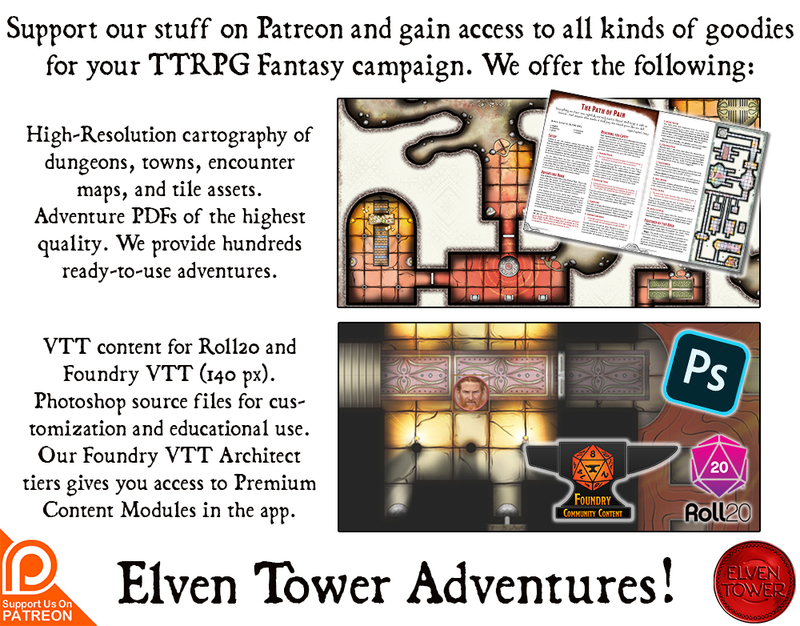 Thanks to your support the quality of art and content will improve with all these new tools. This is a double perspective illustration. Both maps are one and the same, just viewed from a different angle. This is a short adventure suggestion for this map. Of course I drew the map with no furnishings, it can easily be used as anything else. Hopefully this mini adventure will make those creativity gears moving. After a long day of traveling on the main road, your path is blocked by fallen trees. You now it will take hours to clear the path. Also, you’re not the only ones to come this way, there’s clear evidence that previous travelers avoided this blocked path by taking a detour into the woods. You see cart wheel tracks on the mud leading to the forest. Hopefully the path doubles up on itself and returns to the main road after a short while. After a few minutes in the forest trail you notice that this patch of forest is very dense and thick with plants. The canopies are so close together light barely makes it through. It’s still day time, however the idea of lighting a torch is not far off your mind. In the side of a cliff wall you see a cave beside the trail. The cart wheel tracks appear to have stopped here and then continued on their way ahead. You can also see boot marks going in and out of the cave. On a rock next to the entrance there are some markings. Upon closer examination, these arcane marks describe this location as a place of well guarded knowledge. The sigils are old and difficult to read, they speak of a tome of power. The way this is described you have to make a choice on what this tome of power means. It could be one of those magic tomes on the DMG. Or a spell book which belonged to a powerful wizard. Or simply an old forgotten tome with very important information. The three sarcophagi contain ghasts (or similar undead guardians, depending on party level). When they are opened , they attack immediately. A ghost can also be seen flying away from the room with a book in its hands. He is the book’s guardian. He flies south to the room with the pitfall trap. Here other undead creatures come out of the adjoining rooms to help the ghost. This Ghost Guardian, feel free to adapt his stat block to make it an appropriate boss fight. I recommend giving it spell casting abilities if the Tome is of magical nature. The enemies will leave the pitfall trap area clear and expect PCs to attack them and maybe fall down the shaft. For added difficulty, Shadows or Shadow Demons can be waiting down the pitfall shaft (that’s quite lethal btw). This trap is 30 ft. deep. If a creature stands on the area marked on the map. This creature must succeed on a DEX Save DC 14 (adjustable) or fall down the shaft. The damage for falling is 3d6. The only way to get out is by climbing or magic. Climbing the shaft’s walls is not easy, requiring a STR (Athletics) check DC 14 to climb up half your speed. If an ally throws a fixed rope from the room, this check is rolled with advantage.